Darling Harbour is located in Sydney, Australia. Visitors to the harbor enjoy the wide variety of things to do and the special events that take place. Darling Harbour takes its name from Lieutenant General Ralph Darling. He was the Governor of New South Wales in Australia during the years between 1825 and 1831. Originally the harbor was named Long Cove but was mostly referred to by the name of Cockle Bay until 1826. The Governor renamed the harbor after himself. The Great Depression saw the eastern portion of Darling Harbour as The Hungry Mile. This referenced the workers on the waterfront that were searching for jobs around the wharves. Today Darling Harbour is Sydney’s celebration space. Events and cultural festivals are put on here. Visitors of all ages will find something of interest at Darling Harbor. 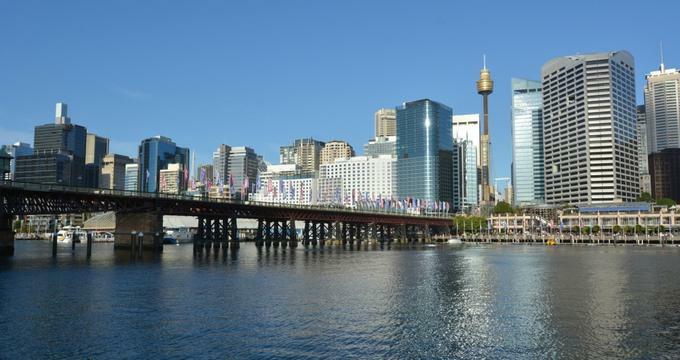 Darling Harbour boasts a variety of activities for visitors of all ages. Chinese Garden of Friendship- The Chinese Garden is a recreation of a traditional garden in China with lakes, waterfalls, pavilions, hidden pathways and exotic plants. Koi carp can be found swimming in the lakes, while willows sways gently in the wind. The garden also contains a teahouse that serves Chinese tea and dim sum. 9D Action Cinemas- The 3D movies that are played in the theater are specially made for the 9D cinema. The movies features surround sound, “active motion” seats, and effects like rain, lightning, snow, wind, fog, feel, and touch. The 9D cinema provides the best sensory “action theater” experience. These movies usually last about eight minutes and are age appropriate for both adults and children. All Occasion Cruises- This cruise line provides a diverse selection of cruise packages. With six private ships and very experienced teams for event planning, a package can be catered to an individual’s needs. Australian National Maritime Museum- The entire family can find something to enjoy at this attraction. This museum features exhibits on naval battles, mutiny, ancient maritime traditions, modern culture at the beach, and water sporting achievements. Interactive exhibits such as the underwater submarine that simulates a wartime battle. Visitors can also get aboard a replica of Captain James Cook’s discovery vessel the HMB Endeavor. Visitors can also climb the Cape Bowling Green Lighthouse of 1874. CNW Gallery- Visitors can sit and have their portraits and caricatures done by the John Chen Gallery team. Darling Harbour Children’s Playground- This playground is one of the best in Australia. The Children’s Playground includes swings, ropes, flying foxes, and slides for children of all ages. The area surrounding the playground contains places to get food or coffee while watching the kids play. Exitus- This attraction is full of real-time puzzle rooms. Each team gets put into a room with fifty minutes to solve the puzzle. The team will work together solve riddles, discover hidden objects, crack the clues, and beat the time clock to escape the puzzle room. These rooms include: Butcher’s Burrow, Forensic, and The Garden. Kingpin Bowling- Kingpin Bowling is appropriate for all ages. It includes twenty bowling lanes, M9 Laser Skirmish, a full bar, and breathtaking views of the harbor. M9 Laser Skirmish- This laser arena is perfect for visitors of all ages. This attraction comes directly from the United States. This laser game experience takes visitors to a new world where their mission is to shoot the bad guys and score the highest points. Madame Tussauds Sydney- This wax museum includes seventy of the world’s most famous stars, Australia’s own stars, and fun interactive experiences. Monkey Baa Theatre Company- This is the premier theater for the young people of Australia. It includes programming and high-quality professional shows and activities. Powerhouse Museum- This museum has a collection of over three hundred and eighty thousand objects. These objects span the fields of technology, design, industry, science, history, and decorative arts. The exhibits of these objects tell their stories and the stories of the people that created, invented, and inspired them. The Powerhouse Museum hosts regular demonstrations, tours, workshops, performances, and other events throughout the year. Sea Life Sydney Aquarium- This aquarium contains the biggest collection of aquatic life native to Australia in the world. Some of these sea animals include platypuses, dugongs, sharks, penguins, and rays. There are fourteen themed areas to explore. They include Discovery Rockpool, Bay or Rays, Great Barrier Reef, and Sydney Harbour. Darling Harbour includes several shopping opportunities. Some of them include the Harbourside Shopping Centre, Austral Stones, Best Real Australian, Between the Flags, Cotton On, and the Crocodile Shop. Darling Harbour also includes a variety of dining options. These options include Abode Bistro, Adria Bar Restaurant, and the food vendors, restaurants, and stores in the Cockle Bay Wharf area.